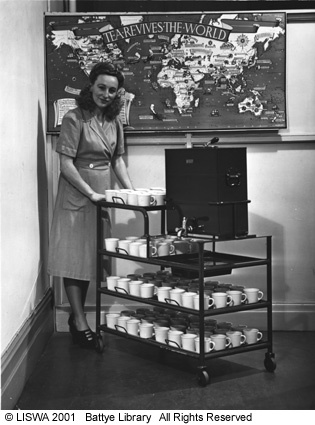 Until the late 1980’s Tea Ladies were a common sight in the larger public service buildings. This months find is the file '87/7646 – Support Services Branch – Tea Service Review 1987' that charts the last few years of the Public Service Tea Lady. Folios 4 and 3 document the beginnings of this change from a fully subsidised tea service. Users were to pay 25% of the tea ladies wages from the 1st of January 1983. This change was as a result of a review carried out in 1982 that proposed transferring the functions of the Commonwealth Accommodation and Catering Services (CACS) to the private sector (Folios 6 and 5). The process of reducing the Tea Service started during August 1987 after limiting it to areas with “a significant demand for a beverage service to conference facilities”. A review was carried out during August 1987 to determine whether the Tea Service was necessary. A copy of this review follows. One impact identified in this review was the lack of tea making facilities for the staff in some buildings. This also impacted on staffing arrangements as staff were now required to make their own beverages.